Firewalks.Com is the official Web Site for "The Fire Energy Experience" We offer a very unique and powerful Firewalk Seminar. Geoff Giovan, the creator and facilitator of this event, is convinced it is one of the most powerful and impactful experiences anyone could have. Please take the time to explore this exciting Web Site. To find out more about this unique seminar go to the Fire Energy Experience. To learn more about upcoming events go to Firewalk Seminars. To be placed on our (email & snail mail) mailing list go to Firewalk Mailing List. To register for the next event go to the Secure Registration Form. 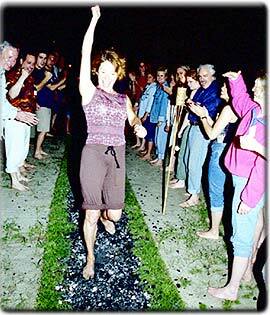 To learn more about the ancient and modern history of Firewalking go to Firewalk History. To browse our Photo Gallery go to Firewalk Photos. To read a very inspirational essay by a "Fire Energy " graduate go to Why Firewalk. To download a PDF file of our flyer go here. "Beyond belief.....awesome....had a career changing experience directly attributed to the firewalk my first Professional golf tournament after the experience. I beat 156 Golf Pros in the greater Portland open in portland Maine and won $10,500.00 in a 3 day tournament. More important than the check was the fact that I was able to play golf without a trace of fear or doubt for 15 straight hours. Before your incredible seminar, I had NEVER EVEN PLAYED THREE HOLES IN A ROW WITHOUT SOME DEGREE OF FEAR OR DOUBT OR ANXIETY. This over a period of 13 years of Professional golf on 15 different tours including the PGA tour. The ability to instantaneously change my state of mind is an invaluable skill to posess in golf as well as in everyday life. I am truly in your debt and I look forward to bringing 15 of my friends with me next year." This is the most empowering thing I have done so far in my life. To be able to get in the zone where you are one with fire is incredible. I can only imagine this is how sports stars have focused their energy to achieve their goals. Now, I too, know how to do this! A mind expanded can never go back so now I must utilize what I have learned to achieve MY goals. "I have skydived, bungee jumped, participated in a native american sweat lodge, and earned a high ranking black belt in the martial arts; Firewalking with Geoff combines the best qualities of all these endeavors into one night of a total life changing experience." What an experience!!! What energy!!! I can see how this experience can help me in so many areas in my life & have already started putting the POWER to work! Geoff, thank you for being such a fine facillitator!!! I feel more powerful & less fearfull. "Geoff is truly gifted and has a gentle and sensitive way about him that allowed me to decide and then know for myself that I could and was going to do this. It was an experience I will never forget." "I attended the Fire Energy Experience at the last minute, after being encouraged by my husband Crandall, and my son Rob to simply observe. I had no idea that I would participate in "The Walk". The entire experience was like nothing I have ever encountered! It was fantastic! We had SO much fun, and it was such an incredible bonding time for the three of us. We have been reminding each other to "shift our state", and we found all the CD's with the beautiful music that we heard that night, and it is amazing how quickly I can go "somewhere" by a simple song. It was so powerful... I have just ordered our pictures to make a collage for the family room. I hope my daughter Suzi will join us the next time! Thanks, Geoff, for an incredible journey, inside and out!" DISCLAIMER: Firewalking is potentially very dangerous. Any information given within these pages is solely for informational purposes. Under no circumstances are you being encouraged to try this activity without the supervision of a trained professional. Should you do so, you are accepting full responsibility for your consequences and actions.